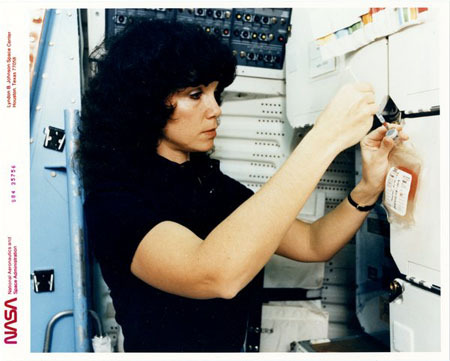 This photograph of astronaut Judith Resnik working on an experiment was taken in May 1984. Resnik was preparing for a project aimed at separating large quantities of biological materials in space for ultimate use in pharmaceuticals. The experiment never took place in space, however, due to the tragic explosion of the space shuttle Challenger shortly after liftoff in 1986. Resnik (1949-1986) was born in Akron and graduated from Firestone High School. She earned a bachelor of science degree in electrical engineering from Carnegie-Mellon University in 1970, and a doctorate in electrical engineering from the University of Maryland in 1977. She began working at RCA as a design engineer in 1971 and was a biomedical engineer and staff fellow in the Laboratory of Neurophysiology at the National Institutes of Health in Bethesda, Maryland, from 1974 to 1977. She was selected as an astronaut candidate by NASA in 1978. During her first mission in space, Resnik and the crew of the Discovery became known as "Icebusters" by successfully removing hazardous ice particles from the orbiter using the Remote Manipulator System. Resnik was killed during her second mission on January 28, 1986 when the space shuttle Challenger exploded shortly after liftoff.